Cleaning your jewelry can be a real pain. If you don’t know what type of cleansing agents to use for your jewelry, there are very high chances that you will end up using some highly corrosive cleaning agents and in the process, damage your precious jewelry. The rule of thumb states that you must always use something that not harsh on your jewelry. You don’t really need to go out in the market with a search mission or even visit an expert to understand your jewelry’s composition. A simple household product can be used for silver and diamond jewelry you have and that’s nothing other than the baking soda. Moisture in air reacts with sterling silver and forms a tarnish layer on the jewelry. This tarnish can be removed using activated baking soda in presence of aluminum. * Place your sterling silver jewelry in a glass bowl. * Add the tablespoon of baking soda in it. * Now pour boiling water so that the jewelry in the bowl is completely soaked. * Tear off a piece of aluminum foil from the sheet and add it to the bowl and leave for some time. As the reaction starts, you will see bubble coming up with the release of sulfuric gases. You cannot see this gas but you will understand by the smell of rotten eggs that is a characteristic feature of the sulfuric gases. Use a plastic chopstick to gently move the jewelry in the bowl just to ensure that all surfaces of the jewelry comes in contact with activated baking soda and aluminum. 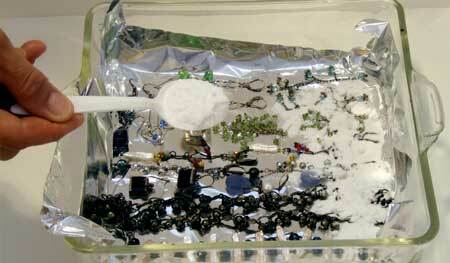 As the reaction occurs, the tarnish binds to the aluminum foil and your jewelry is cleaned. Place the jewelry in another glass bowl and add cold water to rinse them gently. Use a soft cloth or absorbent towel to wipe off the water. Diamond can be effectively cleaned by using baking soda. * Add a tablespoon of baking soda to it so that the organic compound is activated. * Now place your diamond rings in the water and leave it for a few minutes (preferably 3-4 minutes). * There is no need to add aluminum foil. * Take out the rings and rinse in cold water and wipe gently using a soft cloth. For bigger diamond jewelry, you can use more hot water and add another tablespoon of baking soda. Soni is the Chief Editor of BeautyGlimpse.com. She has always enjoyed expressing who she is through her sense of fashion and lifestyle.